Hello everyone! Sorry to drop out of the bog for a while. My mother came to visit us in Edisto Island and then in Charleston. I will post photos and a few details on our time in these places later today. 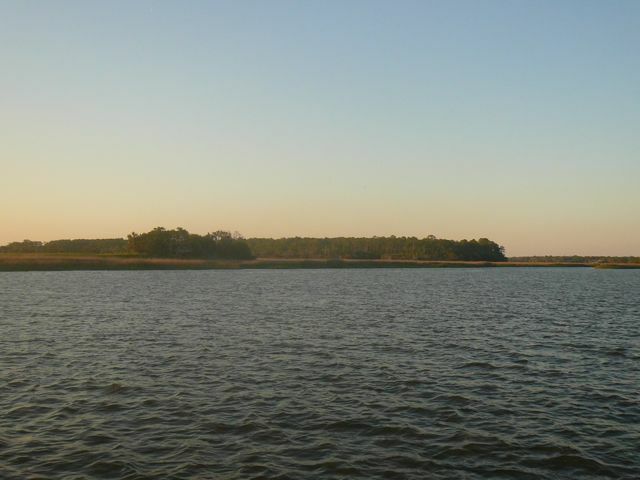 We are currently making our way up the Intracoastal Waterway from Georgetown, SC. The area around us is beautiful! Cyprus trees line much of the shoreline. Osprey nests dot the canopy as well as the navigation markers. Kris and I climbed the mast to get a few photos of the magnificent birds. It must be nesting season or close to it because many of the nests on the markers have an osprey sitting in them and calling out when you approach. We couldn’t see deep enough into the nests, however, to see if there were in fact eggs. We’ll continue down this way until we get to Little River, SC. I’ll post to you all later! Up and ready to go this morning by 0900. Our destination: somewhere to anchor around St. Catherine’s Sound. It was a calm and clear day. With the wind coming at 4.1knts from our stern when we made it out onto the Atlantic via the Saint Simon’s Sound, it was a lazy motoring day. Literally. There was a brief period of time when everyone but me was asleep or laying down. Hooray for auto pilot and GPS! I didn’t have to do much at the wheel myself while everyone became sleepy heads. I constantly kept an eye out for Right whales, as up and down the coast here is their typical hang out this time of year. Alas, I have not been able to spot them. We did see several dolphins, a turtle, many sea birds, and what Kris though looked like a seal. I’m not sure if seals are around here or not, but if so, that’s pretty cool! We made it into St. Catherine’s Sound a little earlier than we had thought we would, so Gary made the call to continue further up the Intracoastal Waterway (ICW) toward Green Island Sound. Once we got up there, we debated on where to set our anchor. We decided on going up to Delegal Creek Marina. We got to the marina around 7:30pm. The development here is very nice. Beautiful twisting southern tress covered in a veil of Spanish moss. White egrets grace the trees around the decorative pond on one side of the neighborhood. I sadly forgot to bring the camera on our walk, and it was getting too dark and the gnats too nasty to warrant another chance at a photo shoot. You will just have to take my word for it. The people here are very friendly as well. One couple offered us true Southern hospitality and invited us to come to their home if we needed anything at all. They were very gracious. Tomorrow will be an early morning as we want to be out around high tide. 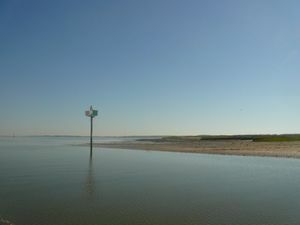 We want to be out of the little creek here, out onto the Atlantic and on our way to Edisto Island, SC all in good time. Wish us good weather! The plantation on Jekyll Island. Lighthouse and a man on a paddle board. Horizons on her way out of the ICW. Cormorant ready for take off. Storms rolled through Fernandina Beach early this morning. We waited out the storms and the low tide in the marina and pulled out at around 12:45pm. 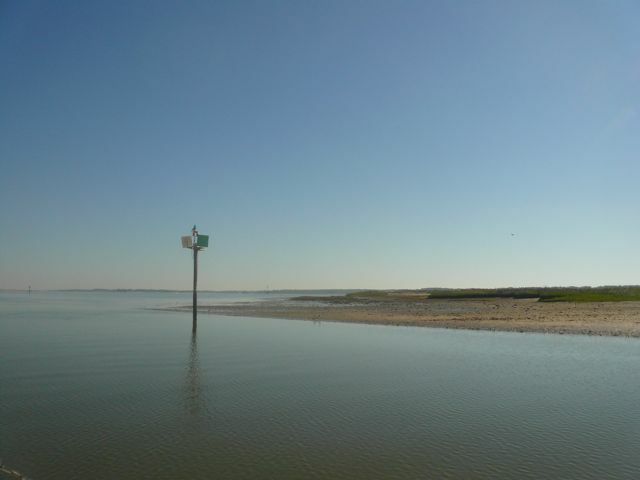 The Inner Coastal Waterway was the way to take today with the possibility of uuture storms rolling in. The motor was a relaxing one. Cumberland Island panned out to our starboard side for much of the trip. Spinny and I kept the binoculars close in order to spy for the wild horses on the shore. Look out into the marsh on Jekyll. We pulled into the waters alongside Jekyll Island, GA around 5 o’clock. Kris and I explored a little of the island. Everything is very spread out, with a couple of homes, a restraint or two, and a gas station and Dairy Queen. 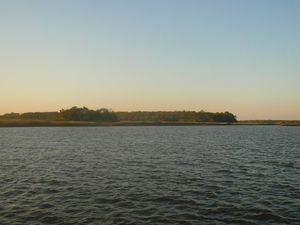 The rest of the island is all lush green trees, including Georgia pines, spanish moss, and marsh. A bike trail stretched across most of the island. It was a peaceful and beautiful walk. Later we took Spin to shore for a good game of fetch the boomerang. She was bouncing all over the dock with excitement and couldn’t wait to begin! She had a great time and got some good exercise. 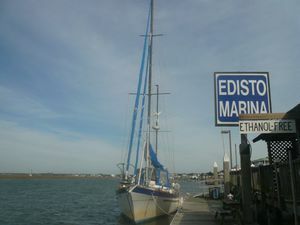 Tomorrow we are heading further up north to St. Catherine’s Island, GA. From there we will head up to Edisto Island, SC. At least, that’s the plan for now! Spin and I look out for the wild horses out on Cumberland. Wild horses off the starboard side! Lighthouse at the north end of Cumberland Island. The bike trail on Jekyll. Pond along the bike trail. Spin got to play boomerang on shore. She turns on a dime. Spinny is so happy to be playing! Horizons and the Inner Coastal horizon. On the 8th we crossed from Cape Canaveral to Fernandina Beach, FL on Amelia Island. Once again Kris and I were on night shift and Gary and Carol took the day shifts. In the night Kris and I heard a distant slap over the water. Maybe it was the waves n the side of the boat? Then we heard it a second time, louder, and echoing off the sides of the boat. Suddenly all of the radio broadcasts about right whales being in the area ran through my brain. Oh please, don’t let us run into a whale in the night! Kris and I looked out into the dark. Then, another slap and a surprised shout from Kris. Something had leapt from the water and splashed doing with a loud slap. Kris thought it looked to be a ray or a large fish, but not a whale tail or fin. Thank goodness! I’d love to see whales…but when I can actually see them and not hit them in the dark. Valerie and Lauren. 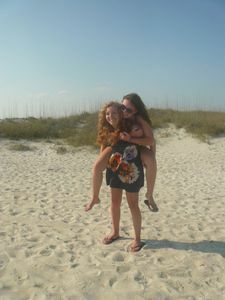 Sisterly love! As we pulled into the Fernandina Marina on the 9th, we were greeted by our friends Linda, Lauren, Valerie, and Garren Erlenbusch. They had driven up from Cape Canaveral just a day behind us. Spinny was bursting with joy to see our guests. She leapt off of the boat as soon as she could to say hello and receive hello pats and rubs back. We spent three days in Fernandina, two with the Erlenbusches. We packed in a variety of different activities. We sunbathed, shell searched, flew the power kite, and spotted jelly fish and power paragliders on the beach. We thought about swimming, but didn’t stay in for long. It’s amazing how much cooler the ocean is further north by a few hundred miles. We drove through the local national park, past RV campers and the Fernandina Fort. 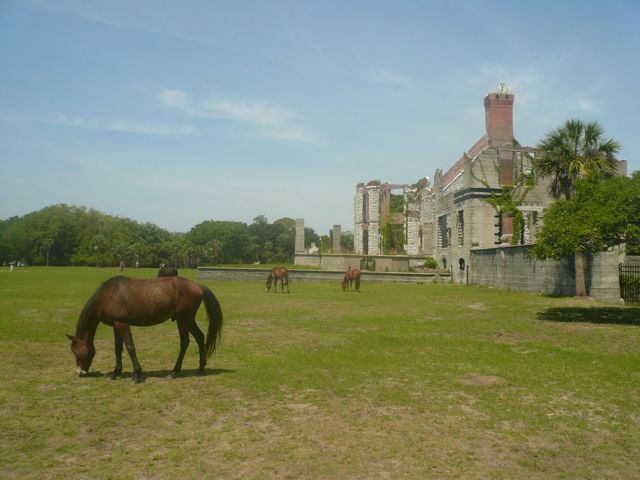 The Cumberland island wild horses! 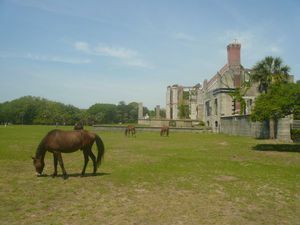 We took the dingy out to St. Mary’s, GA and Cumberland Island, GA. On Cumberland Island we saw remains of the old Carnegie summer mansion, wild horses, armadillos, and wild turkeys. On their trip over, Carol, Kris, and Linda glimpsed a manta ray in the water. Out on the water we also spotted dolphins, white pelicans, other sea birds, and a few manatee noses. In the marina a manatee and a sea otter came visiting. The girls found time to go shopping downtown and we all enjoyed Italian woodfired oven pizza from Arte’s Pizza. What a busy past few days! Kris casts a net over the dock, looking for shrimp. Time to fly the kite! Mini squid Garren and Kris caught. Cormorant on a massive mooring ball. “Steel Away” the steel schooner. Fairbanks home, now a bed and breakfast. On the corner of 7th and Cedar. Garren and Kris are such clowns! Docks on the Amelia River marsh. Spinny in her air conditioning. The gates of the Carnegies’ summer home. What remains of the Carnegie mansion. Rolling an apple to the horses. Wreckage of the servants house. 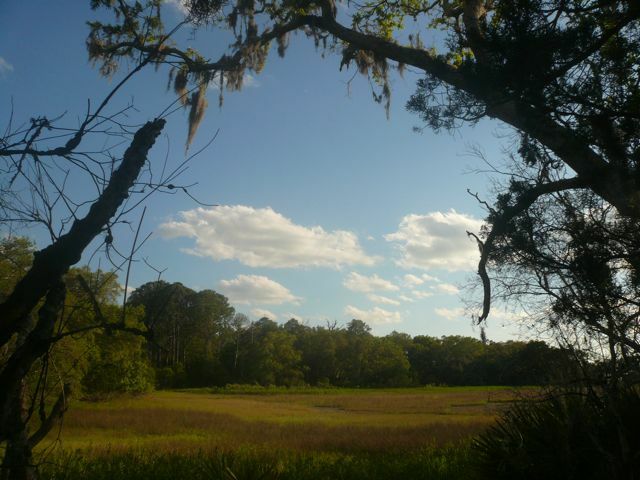 Nightingale Trail on Cumberland Island. Stone house on the corner of 7th and Ash. Carousel house on the corner of 7th and Ash. Big old oak in the middle of the road. Great blue heron on the dock. The great blue heron flies by Kris. 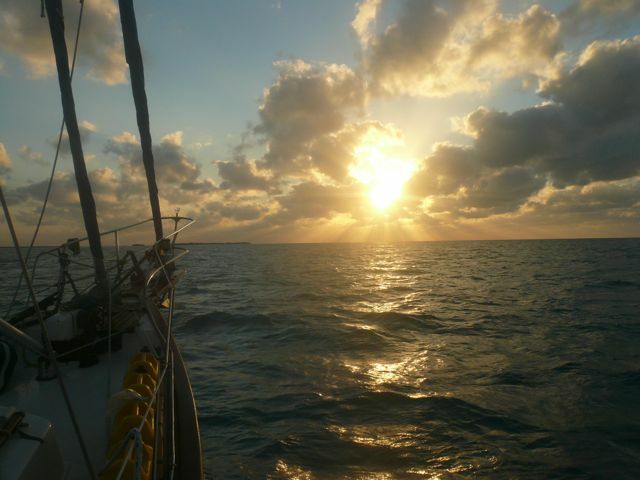 We sailed all night from Great Sale Cay in the Bahamas to Cape Canaveral, FL. Kris and I took the night shift from 8-5 and Gary and Carol took over in the morning. By morning we had made it into the Gulf Stream. At the heart of the Stream the current pushed us up to 5kts. Gary said that the boat went up to 11kts earlier in the morning. We were zooming! The Gulf Stream was teeming with wildlife as well. Gary hooked another mahi mahi, but the fish sadly got away. 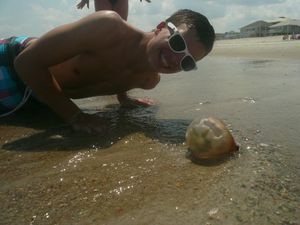 We spotted a few dolphins, turtles, and a couple of Portuguese Man-O-Wars, the huge jellyfish. The sail membrane on their head sticks out of the water and looks almost like a plastic bottle floating on the surface. 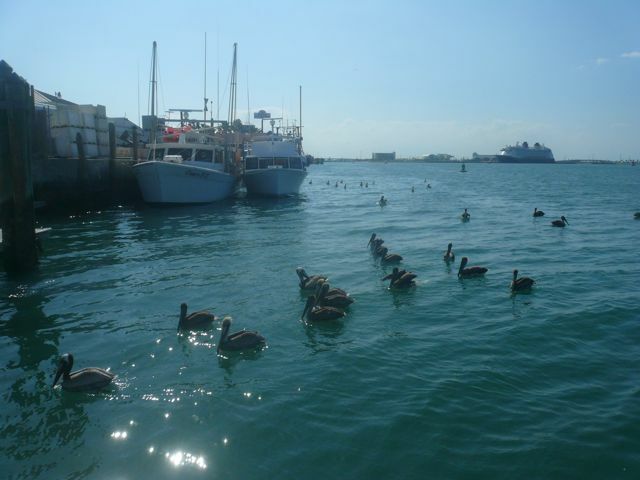 When we pulled into Cape Canaveral we were greeted by the pelicans, dolphins, and a NASA launch pads. It’s too bad we will not be here when the space shuttle launches! After sailing for nearly 30 hours, our tired eyes were overwhelmed with activity. Boats, from small dinghies to large cruise ships, everywhere! Crowds of people and large buildings up and down the channel. We weren’t in the Bahamas anymore! In the evening we went out to dinner and relaxed after the long crossing. Everyone was in bed early tonight! The mahi mahi that got away. NASA launch pads in the distance. Uh oh! The coast guard! Pelicans off the starboard side. Cruise ship. Good for waving at to receive return waves ten fold. Look who’s trying to get some fish. Another early morning. This time it was a race to get through the dangerous Whale Cay cut and into Green Turtle Cay before the storms rolled in in the afternoon. We made it without any problems and pulled into the dock at the Green Turtle Club smoothly. We like the Green Turtle Club for times when a dock is preferred (as in expected storms), because any money you spend at the restaurant or bar goes to your docking fee. So if you want to eat out or get some drinks, why not do it here and get a dock at the same time? The food is amazing at the restaurant, if docking is not enough of an appeal to stop by. Even if you anchor or moor out in the harbor, I recommend you take the dingy in for a good meal. Model plane at the model boat shop. 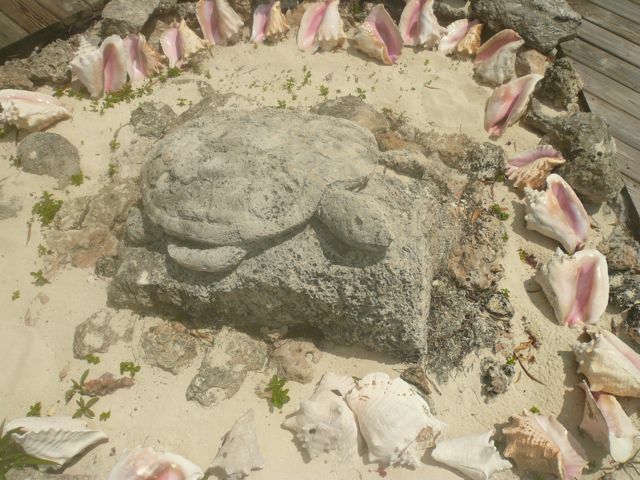 Green Turtle cay is also a good vacation destination spot. There are several beach cottages for rent around the island. If you rent a golf cart as well, you can explore the island and spend some time in the little town of New Plymouth. The town has the usual array of stored and restaurants, as well as several ice cream stops. 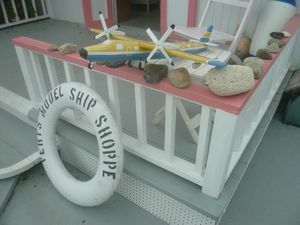 There are several historical museums and a model boat shop. It is a very quaint island town, very enjoyable to walk around, and full of cats! I have never seen so many cats…popping out from around corners, under porches, over fences. Meow! This may well be the last post sent from the Bahamas. We are planning on leaving for Great Sale Cay tomorrow, and then leaving from there late Thursday/Friday for Cape Canaveral, FL. I will let you all know when we are back in the states! The restaurant at the Green Turtle Club. Part of the beach close to the beach cottages. The storm is a commin! We headed out to Marsh Harbor on Sunday. The waters were calm and tranquil, the wind nearly nonexistent. On the way over we spotted a yellow sea plane, flying low over the water, appearing to almost skim the glassy surface. Kris instantly wanted to take a ride, or fly the ride! Marsh Harbor is a very functional sort of town. It’s a great place to stock up on supplies, with an excellent grocery and hardware stores. 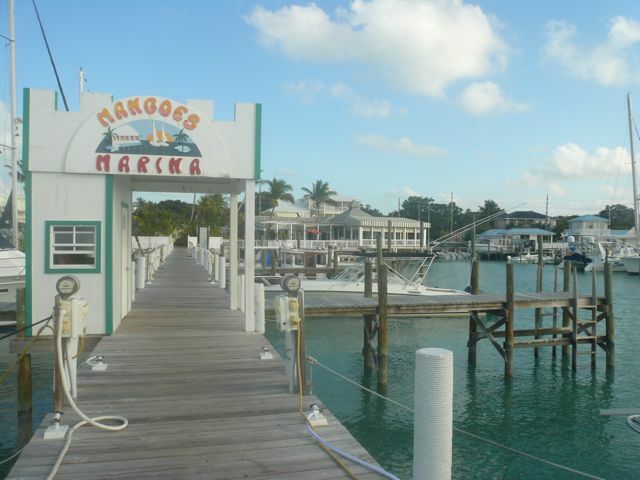 We’re staying at Mangos Marina where we can dock at 85 cents a foot for two days. The typical commodities come with the package: laundry (at $3.50 a load), showers, restaurant and bar, and water and electric (at a small extra price). Perhaps the most important place for us here in Marsh Harbor is the vet. Spin had an appointment just this Monday morning. She’s doing much better. The vet was not able to take a blood sample yet. Apparently not enough time has past since her last appointment. He did give her another shot and poor Spin’s eyes are now dilated. She’s taking it extra easy today. The rest of us are all taking it easy as well. Gary’s arm’s been hurting from the epic lobster battle. He’s scraped and bruised, but thankfully not infected. He got some medications for his injured from the clinic today. Kris, Carol, and I have been concentrating on cleaning and organizing. We’re all preparing for the long crossing from the northern Bahamas to the US. That yellow splotch is a sea plane.